Every year I take part in this amazing event and every year it just gets… well even more amazing. Fallow this link for a wonderful post “WELCOME TO THE FAIRELANDS!” by Sonya Marmurek. In her post you can see pictures and descriptions of each sim that make up the event. This year you can find BlueMoon enterprise on the Echtra sim designed by Loki Eliot, Sponsored by The Lost Unicorn Gallery. 100% of sales of the BMe Saoirse outfit will go to RFL. The outfit consists of a top, (5 standard sizes) skirt (easy fit 3 standard sizes) an alpha for both and is offered in 4 colors, Amber, Aqua, Orchid & Peridot. Separately sold is the Crown and belt that coordinates with each color. The cost is only 300L for the top/skirt set and 150L for the Crown/Belt set. BMe King Ratherbe outfit is well, fit for a king. It’s Justaucorps (coat) is made of silk satin and lets off a soft sheen. The Cravat and ruffled sleeves are made of silk damask with a swirl of color and shine. The Breeches are made to be worn with boots (included) or tights & slippers. It’s finished off with a silk satin cloak. To tie it all together I added a crown just because no king can have too many. Outfit & Cloak is Rigged Fitted mesh, boots & crown are non-rigged mesh. 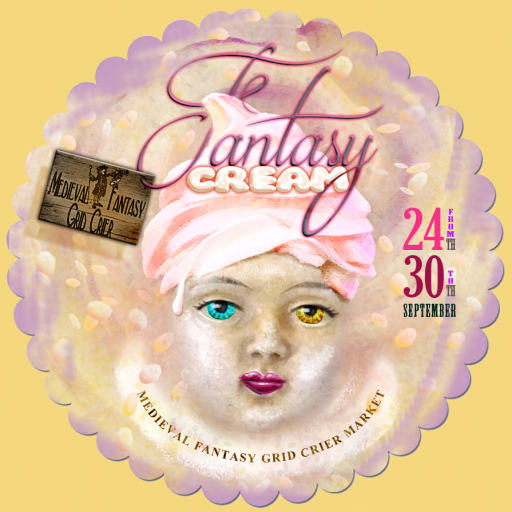 We are honored to announce the proud winners of the third FANTASY CREAM – MFGC Merchants Contest! 3rd PLACE – We got JOINT WINNERS !!! !